WARNING: The mains plug must be disconnected before making any adjustments. 1. Insert the hexagonal key provided into the screw head at output shaft. 2. Choose the suitable tip for your job. The pointed tip can be used on all cement based grout joints sanded or non‐sanded, when the grout width is 3mm (1/8") or less. The chisel tip is best used for varying widths of grout, for example shower, bath & sink areas, floor tiles, wall tiles, fireplace tiles, etc. 3. 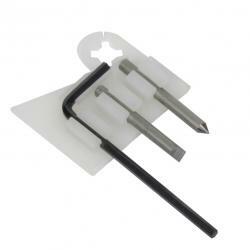 Turn the hexagonal key anti‐clockwise and place the tip into the tool. 4. Ensure the tip is fully inserted into the tool. 5. Turn the hexagonal key clockwise to tighten the tip. Once tightened, gently pull on the tip to check it is securely fastened in place. NOTE: Do not over tighten as you might damage the hexagonal key and/or screw head. NOTE: Always wear safely glasses, dust mask, and hearing protection when using the Plasplugs Electric Grout Remover. 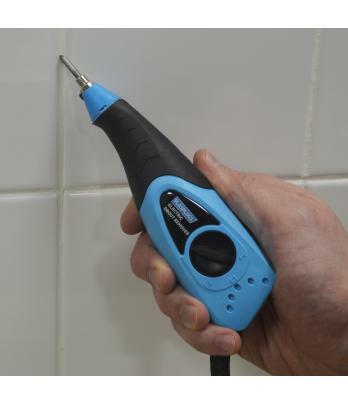 The electric grout remover tool is only suitable for interior re‐grouting jobs. 1. Make sure that the tip is securely fastened. 3. 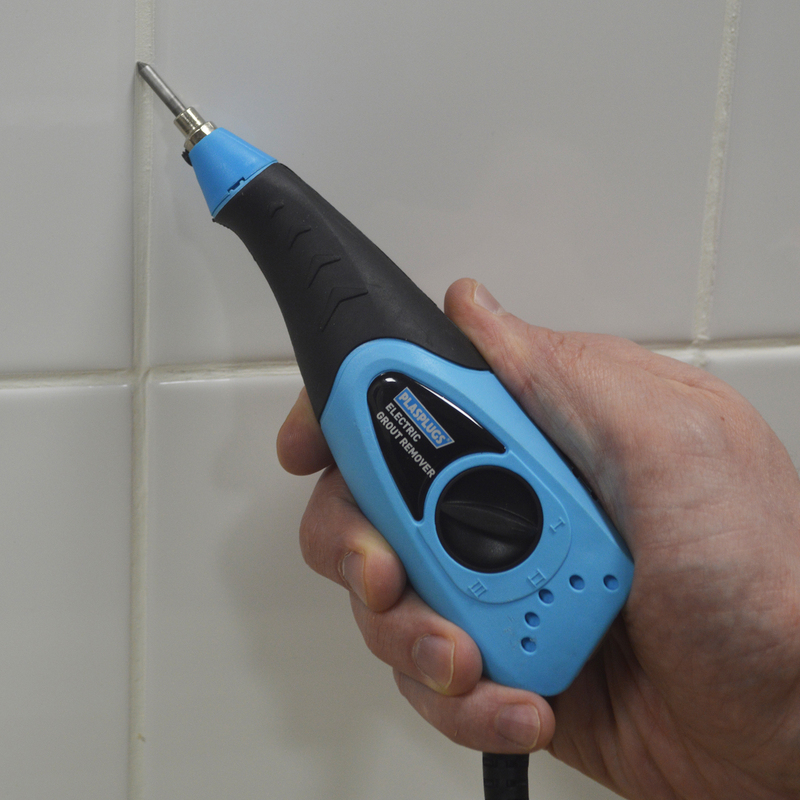 Hold the Electric Grout Remover at a 45 degree angle. 4. Switch to “1” to turn the tool on. 5. Initially, the tool should be run at low speed applying minimal pressure to remove grout. Increase speed and pressure as required for optimal performance. Applying too much pressure will cause the tool to stop vibrating. 6. Switch to “0” to turn the tool off. NOTE: Please ensure appropriate tip is used for the grout joint to be worked on. Check the width of the tip against the grout line to ensure that the tip does not touch the tile, as the supplier will not accept liability for any possible tile damage. 1. Low position is for fine detail, and the narrowest of grout widths. 2. Medium position is for detail of trim pieces, qtr‐rounds, v‐caps, liners, etc. 3. High position is for speed on the field tile, counters, walls, floors, etc.